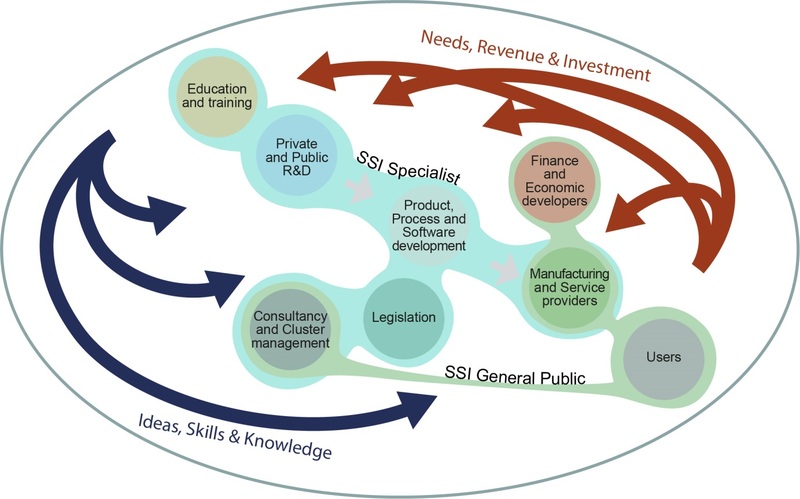 A business ecosystem may be defined as a sustaining environment to promote economic growth, skills growth, and growth in industrial capability and global competitiveness, fuelled by the extension of knowledge, the ambitions of innovators and the business and societal needs of the community at large. Partial ecosystems relevant to this Research Agenda exist in the form of national and regional groupings of business and public research actors, special interest groups, knowledge transfer networks, research collaborations, and the tiered supply chains of major industrial players. These groupings, although many of their members have relevant resources, do not explicitly recognise a focus upon Smart Systems, and are not yet marshalled to push EU capabilities in what is becoming a dominant and global industrial arena in the run-up to 2020. A truly proactive ecosystem would accelerate the adoption and bring forward the rewards of Smart Systems.